Nearly all 68HC11s are supported. New Seehau User Interface: Windows 95, 98, NT, ME, 2000, & XP. 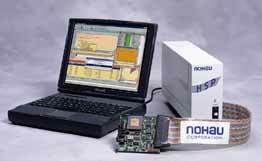 Emulation and trace ISA boards install in your PC or in the Nohau® HSP box (shown) and via the PC LPTx port. Optional trace board can be installed or upgraded later. Trace and Triggers configured and accessible in real-time. High Level Language (HLL) support for C compilers. Unlimited Breakpoints, Bank Switching, Program Performance Analysis, and Code Coverage. Supports all HC11 chip RESET modes.